“You sleep all day,” she said. 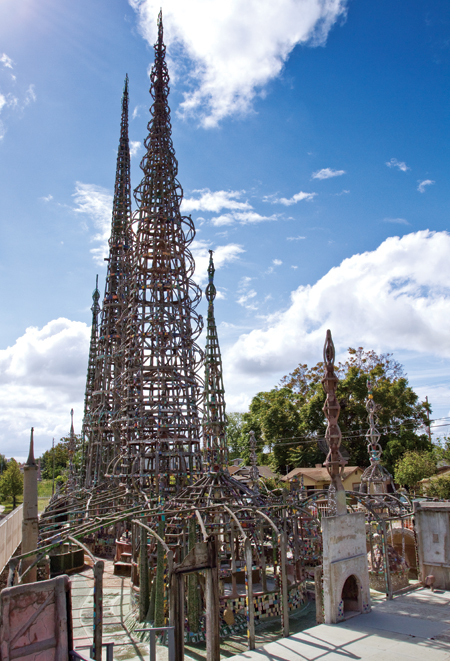 Lolamouse posts cool pictures of visionary art from the Baltimore Museum, but I have gone with Watts Towers, by Simon Rodia, a great visionary artist, who built these very cool towers in his little yard. The picture is courtesy of LA County Museum of Art, and is supposed to be available for free use. So sorry to be late with commenting! Good luck to all doing Napowrimo! I’ll be around! This entry was posted on April 16, 2015 at 10:09 pm and is filed under poetry. You can subscribe via RSS 2.0 feed to this post's comments. Susie and I are the laties (up late people) from Houston, outsiders to NYC. But I like NYC, I just don’t go there enough. Mine is very late and I think not a real poem. Yours will pass my muster. Is there really such a thing as Outsider Art? If so my ambition might be to go back to school, learn how to do art and sing, and become an outsider artist/busker. I like your story, to me it is prose poem. But what do I know, I am not a real poet, only one who loves to write poems. Ha. You are always kind, Jim. I always think of “outsider art” as being very like visionary art in that it is often made by people who are quite driven by artistic things but are not part of the central art community; often naive artists–or that’s another term, I think. That’s always been my kind of definition of it–but I don’t know how standard it is. I have been writing a novel called outsider art for some time, and I have a little song I started working on yesterday but I don’t know if I’ll get it together during this month! k.
Prose or poetry.. sometimes there is no real difference, I once heard it’s what the librarian decides that counts.. I think snobbery exist in all places.. could we ever avoid feeling a little better I wonder. These sorts of discussions are always full of heavy freight–between two people, I mean. Here there is so much more going on about being outside of something than just observations about creative schools or forms–it’s abut intrinsic separation, how the Other is always mysteriously the Other, and how that attracts and isolates and infuriates us in about equal proportions–or so I read, but that could just be my personal slant talking. This was a smooth read, k, despite the length. In the book, it’s actually a brother and sister, and of course, a lot is going on, but after I wrote it last night, took out more extraneous bits that related to bigger story–it was just so long. I have another one probably for your prompt if I can remember it–I’m afraid I had to get to work, and I seem to have forgotten some, but hopefully can recover as the day goes on. k.
This is a lovely teaser to a much longer tale. Thanks for sharing, karin. This was such an interesting and fun read! The dialogue sounded real and it flowed easily. Prose poem? Poetic prose? Who knows, but I like it! Let us know when the book is complete-I’d love to read more and thanks for participating! I can totally relate to and feel her envy fueled irritation with his certainty. This is excellent, K.
stellar. want to read more. Watts Tower is about an hour from me, but (shamefully) I haven’t been.